How to Dry, Freeze, and Store Fresh Mint: Savor the Flavor All Year Round! Don't waste a precious leaf of your homegrown mint! 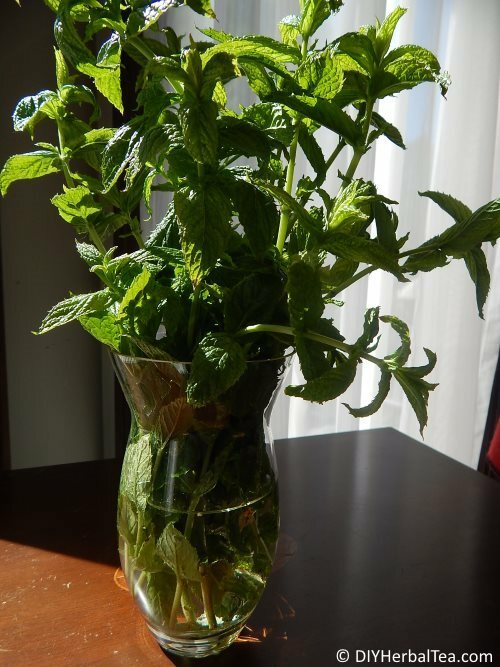 Let me show you how to preserve and store your mint so its flavor stays fresh for up to a year. Gotta Save Some of This for Winter Tea! 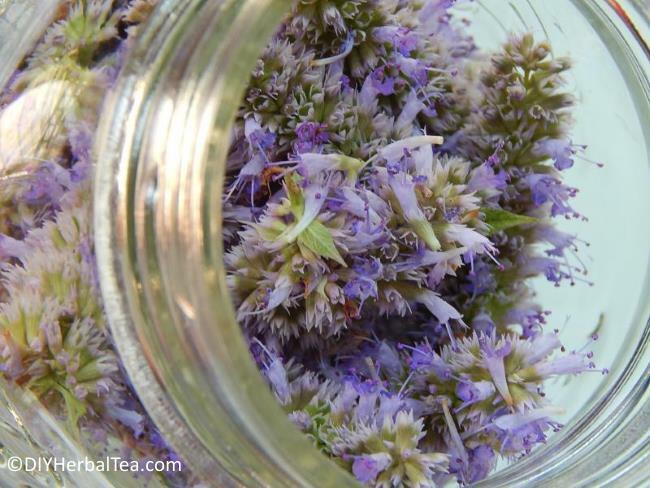 Before we begin, grab your snippers and go harvest a handful of mint sprigs from your herbal tea garden. Freshly cut mint has the best flavor. And that's what we're aiming to preserve! As soon as you've harvested your mint sprigs, rinse them off to remove any dust, dirt, and tag-along critters. I use my garden hose. But a quick spray or swish in the kitchen sink works just fine, too. Now gently shake, shake, shake to remove most of the water. Then finish drying by lightly patting or loosely rolling your mint sprigs in a clean cloth or paper towel. 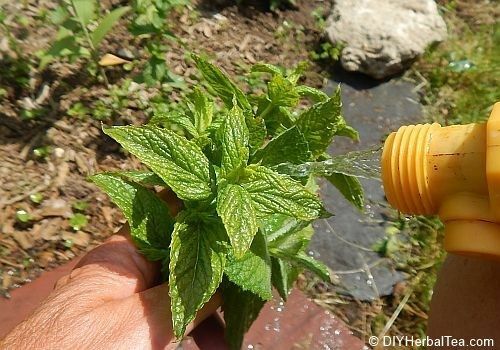 This is a great way to keep newly harvested mint fresh for a day or two. Any longer than that, it'll quickly begin losing its garden-fresh flavor. Store the container out of direct sunlight. Tip: If your sprigs start looking droopy, pop them - container, water, and all - into the fridge (not the freezer!). In no time at all, your mint should perk right up. Hint: If you're going to leave your mint sprigs in water for more than a few hours, it's a good idea to remove all leaves that'll be sitting below water level. Otherwise, the submerged leaves will start to degrade, and the water will get all yucky smelly ick! Spread clean leaves in a single layer on the trays of your food dehydrator, leaving a little space between each leaf for air to circulate. Close the lid on the dehydrator, turn the temperature to a super-low setting, and flip the power switch to "on". That's it, that's all. There's nothing more to it than that. 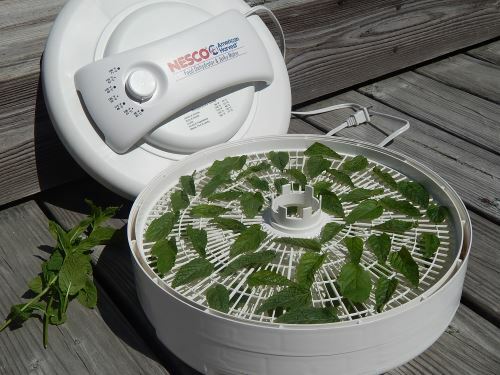 At a steady 90° F (32° C) in my food dehydrator, "juicy-leaf" herbs like apple mint dry in about 14 hours. 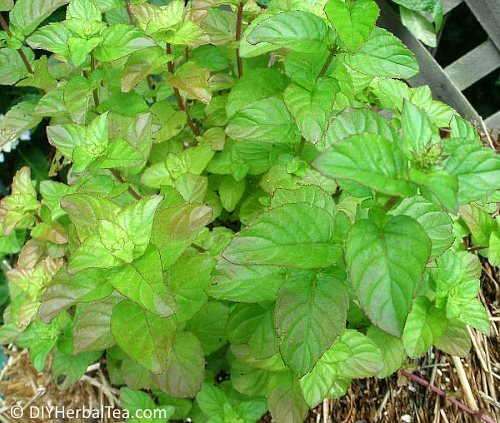 Common garden varieties like spearmint and peppermint take less time - usually 10-12 hours, give or take. Strip a few sets of leaves off the bottom of each stem. Gather 5 or 6 stems together loosely. 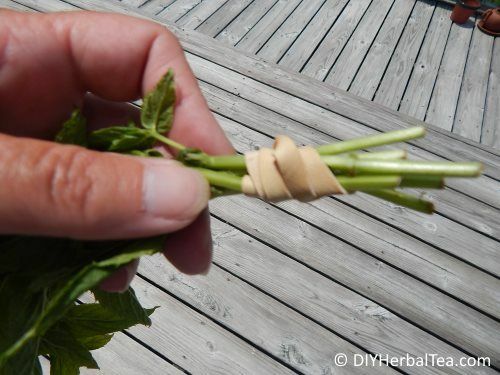 Take a piece of twine, a twist tie, or a rubber band, and wrap it around the cut-end of your bundle of mint stems. Make the wrap snug enough to hold the bundle together, but not so tight that your mint leaves are all squished together. To dry evenly, the leaves need a little air circulation. Hang the bundles upside down in a cool, well-ventilated location, out of direct sunlight. It'll take anywhere from 2-7 days for your mint leaves to dry completely, depending on the size of the leaves, their water content, and the humidity in the room. When the leaves are fully dried, strip all the leaves off their stems, and put the dried leaves in a clean glass or metal container for storage - again, out of direct light. Spread your mint leaves in a single layer on a cookie sheet. Pre-heat your oven to the lowest temperature setting possible - preferably no higher than 90° F (32° C). Slide the cookie sheet into the oven, onto the center rack. Leave the oven door slightly ajar to allow for some air circulation. Estimated drying time in a barely-warm oven is about 6-8 hours. Mint is one of the few tea herbs that actually dries pretty well (and very quickly!) in the microwave. Spread a single layer of mint leaves on a clean paper towel. Stick them in the microwave and zap for 15 seconds on your microwave's lowest power setting (probably the "defrost" or "warm" setting). After 15 seconds, open the microwave's door and leave it slightly ajar for about a minute, giving your mint leaves a little rest from the heat. Continue zapping at 10-second intervals, allowing a one-minute resting time in between each zap, until the leaves are fully dried. Freezing sacrifices some of an herb's flavor, but it's an okay way to preserve your fresh mint if you're in a hurry. For best results, mint leaves should be removed from their stems before freezing. Lay a single layer of leaves on a pre-chilled cookie sheet. Put the cookie sheet in the freezer, and leave it there, undisturbed, for at least 3 hours. When the leaves are completely frozen, transfer them into a re-sealable plastic bag. Remove as much air from the bag as possible. Seal the bag tightly, and return it to the freezer for storage. Helpful Hint: The frozen leaves thaw very quickly. So get them off the cookie sheet, into the bag, and back in the freezer as fast as you can!